•Prosecute in European courts all Israeli settlers with dual EU citizenship who are suspected of violence against Palestinians. “For half a century, Israel has continued to deny Palestinians their freedom and basic human rights in complete disregard for international law and United Nations resolutions. “Instead of ending the occupation – as demanded by the international community – Israel has taken concrete steps to make the occupation permanent by moving approximately 650,000 settlers into 125 settlements and 100 ‘outposts’ in the Occupied Palestinian Territory (OPT) while retaining almost exclusive control over land and natural resources. “In addition, Israel has illegally annexed East Jerusalem and the occupied Syrian Golan Heights, built an illegal wall inside the West Bank and kept, for over a decade, the Gaza Strip under blockade. GUE/NGL said that the persistence of the occupation, and the impunity afforded to Israel by European countries, have fuelled global instability. 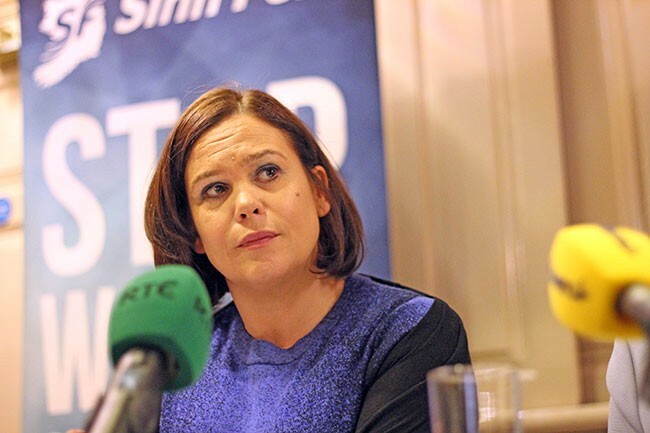 Sinn Féin deputy leader Mary Lou McDonald TD addressed an Ireland Palestine Solidarity Campaign rally at the Israeli Embassy to mark the occupation’s anniversary. She repeated the party’s demand that the Irish Government act upon the Oireachtas motion tabled by Sinn Féin three years ago to recognise the State of Palestine. “We are here outside the Israeli Embassy to say with one voice that we demand justice, peace, nationhood and basic rights for the Palestinian people in their homeland,” the Sinn Féin deputy leader said. “We are 50 years on from the annexation of Gaza, the West Bank and East Jerusalem and we have had 50 years of injustice. It has to end. “Ireland is a country that knows a lot about colonisation and dispossession because we suffered it here too. So I think that Ireland should lead in the demand for justice for Palestine.